Comprehensive review of CeraVe Skin Renewing Cream Serum. See how this retinol cream compares against other wrinkle creams! CeraVe Skin Renewing Cream Serum is an average retinol serum for many reasons. One of the first things I noticed about this product immediately is that retinol is very low on the ingredient list, so I didn’t know how well this product would work. But, to my surprise, it did work better than I thought it would initially. The feeling of CeraVe Skin Renewing Cream Serum is like a normal serum texture, but as you rub it out into your skin, it feels a bit creamier, and very silky and soft. I really like the applicator on this product since it instructs you to only use it where necessary; the precise applicator makes it easy to control the amount of product used. At first, I didn’t really notice much of any short term results. My skin felt soft for sure but the fine lines and wrinkles looked exactly the same. After time, there was a bit of a difference in my fine lines and wrinkles and my skin looked a bit plumper than it didn’t before. But, despite the small differences I saw, it wasn’t anything amazing. Overall, CeraVe Skin Renewing Cream Serum worked to help my fine lines and wrinkles a little bit, but not as much as I would expect coming from a retinol serum. CeraVe Skin Renewing Cream Serum has a light serum texture, but as you rub it in, it feels a bit thicker and creamier and even turns a bit white. This product definitely has a nice feeling on the skin while still being really light and weightless. I really like the applicator on this product. The product is in a tub and has a pump applicator, but it has a really small opening to dispense the product so you don’t use too much. The directions tell you to put this product where needed so I found that the small applicator made it really easy to apply the serum precisely on the areas I really wanted it. CeraVe Skin Renewing Cream Serum dries pretty quickly in about 10 seconds. It leaves the skin feeling baby soft and hydrated which I really like. This product has no smell to it at all. If anything, there is a really soft “serum” smell but definitely no added scents. Short term I didn’t really notice much difference to my skin at all. I had to really pay attention to the areas I applied it since I didn’t apply it all over, but overnight I couldn’t really see any difference. Long term I didn’t notice a small difference in the fine lines and wrinkles on my face. The areas of concern definitely had filled in a bit and plumped a bit but it wasn’t anything super drastic. CeraVe Skin Renewing Cream Serum contains Hyaluronic Acid, Shea Butter, and Caprylic/Capric Triglycerides which are all known to be great for antiaging. Hyaluronic Acid is one that is very commonly put in many antiaging products as we have seen. It’s known to renew the skin’s outer layer which can significantly improve the appearance of fine lines and wrinkles. Shea Butter is another ingredient in this product which is great for the skin. It can help boost the skin’s collagen production and repair any damage to the skin. Caprylic/Capric Triglycerides contains fatty acids which are supposed to help restore moisture to the skin which can help with plumping fine lines and wrinkles. All three of these ingredients in combination should greatly help reverse the signs and appearance of aging. The cost of CeraVe Skin Renewing Cream Serum is $13.65 for 1 oz which comes to $13.65 per ounce. This is an average or semi-below average price for a retinol serum. Unfortunately, there isn’t any money back guarantee for CeraVe Skin Renewing Cream Serum. 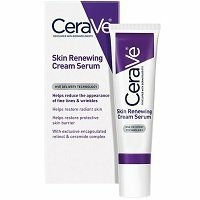 To buy CeraVe Skin Renewing Cream Serum, click here.